In October of 2005, twenty hand-painted wooden panels were framed and mounted onto the east-facing wall of Los Angeles Little Tokyo’s Japanese Village Plaza to form the “Home is Little Tokyo” community mural. Nearly three years in the making, the mural is truly a community project: commissioned by a large coalition of local residents, businesses, and service organizations, “Home is Little Tokyo” was designed by local artist Tony Osumi based on numerous ideas offered by the local Japanese American community. Each panel was lovingly painted by Osumi and fellow artists Sergio Diaz and Jorge Diaz, along with nearly 500 volunteers who worked together to contribute over 5000 volunteer hours during open painting days. 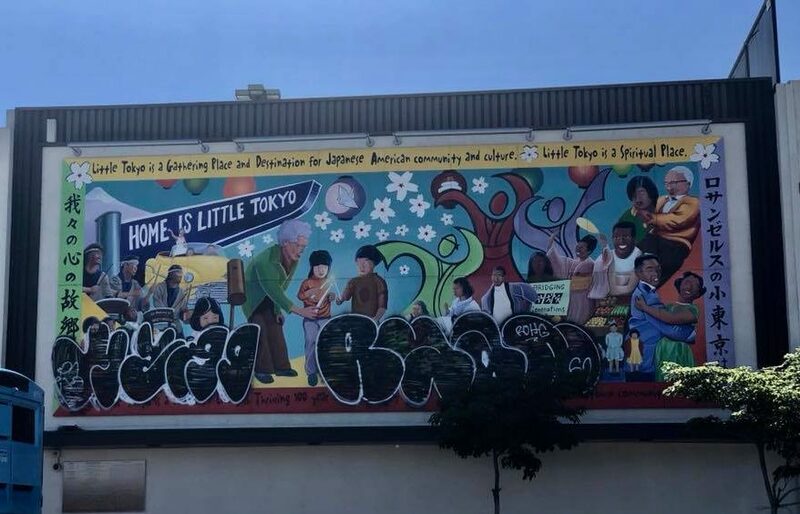 The deep significance of the “Home is Little Tokyo” mural for the Little Tokyo community is why many were shocked, heartbroken, and devastated this week to find that an anonymous person had defaced the entire lower half of the mural with spray-painted graffiti in the early hours of Sunday morning.